← Pinstitch~~What’s it all about? 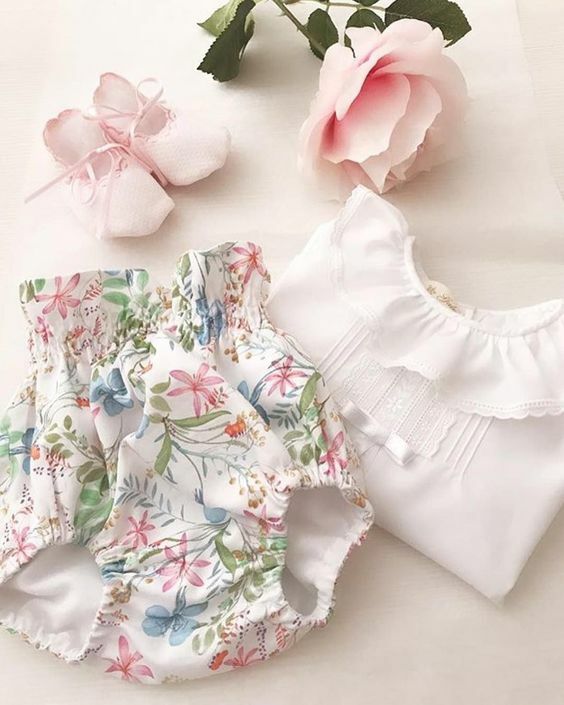 Pin stitch is almost always connecting one thing to another, like lace to fabric on the sleeve to this shadow smocked dress or the angel blanket above. 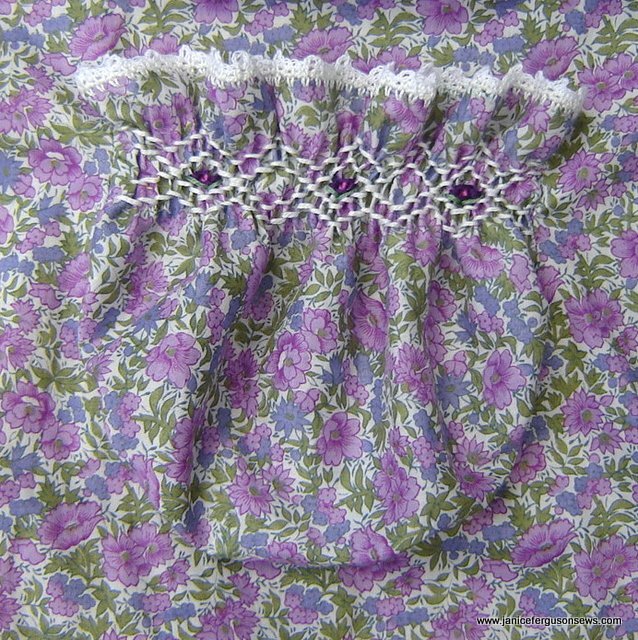 Often it joins fabric to fabric as you see on the hem of American Girl doll Molly’s lace tape nightgown above. 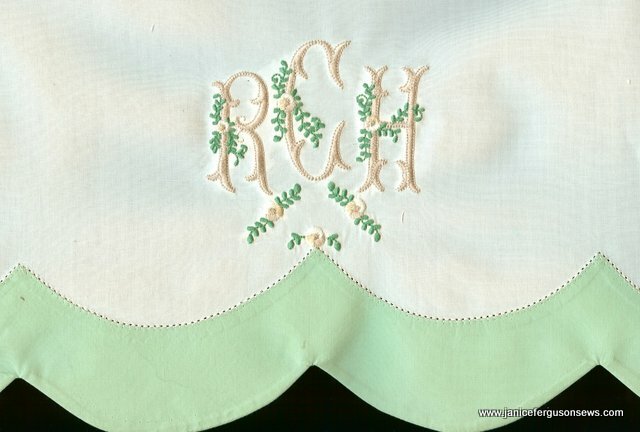 Or in the case of Madeira applique’, shaped fabric to fabric. I like to have my lace or applique’ fabric in place before I begin pin stitching, which is what was done in preparation for securing the hem of this linen Madeira applique’ baby pillow with pin stitch. 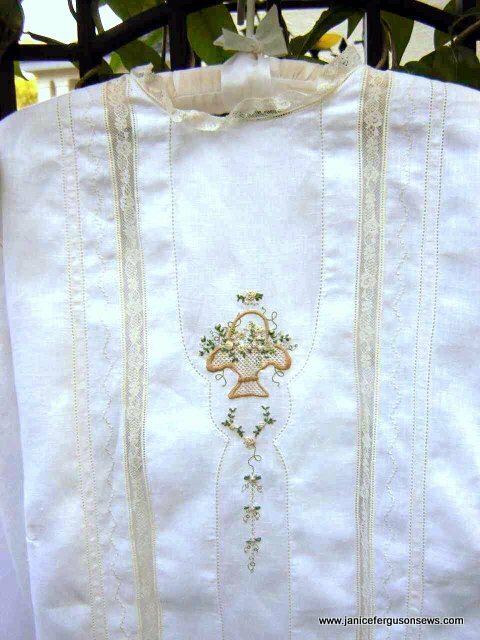 In the same manner, the hem on the Brother bishop dress below was prepared. 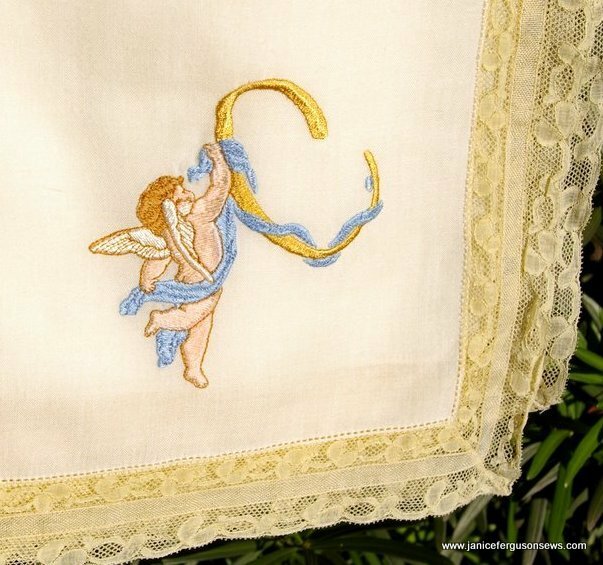 For Madeira applique’, I machine baste the crisply starched applique’ fabric in place 1/4-3/8″ away from the folded edge, with fine thread and a #60 needle, so as not to leave noticeable holes in the applique’ piece. Step #1…Of course, you would not use black thread. Use thread to match the lace. 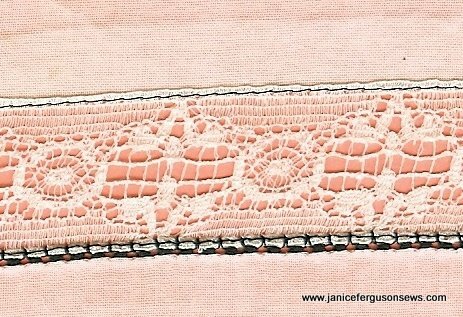 For lace edging, step #1…I prefer to place the lace on top of the fabric with decorative edge even with the raw edge. With #80 wt. 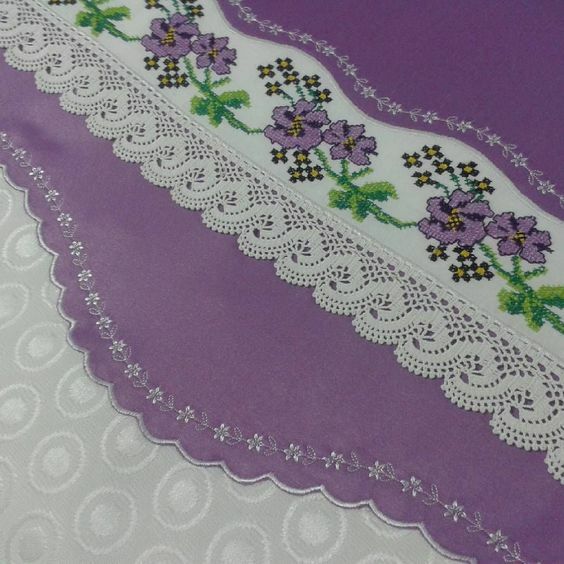 thread in the color of the lace, straight stitch in the header of the lace, securing it to the fabric. Step #2 Fabric under lace has been pressed up away from lace edge. 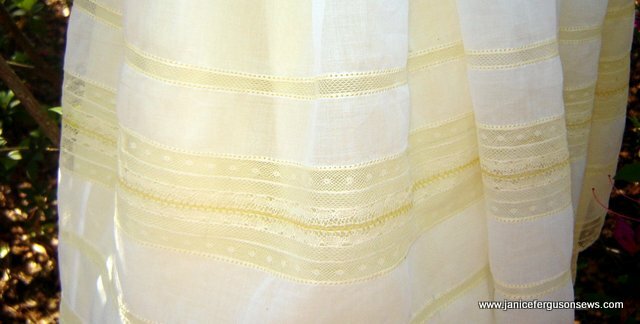 Step #2~ the fabric that lies under the lace is pressed away from the edge. This renders a lace edge straight stitched to a folded edge. The pin stitch is worked with the forward/backward stitches in the fabric. Stitching over the fold makes the lace attachment more secure. 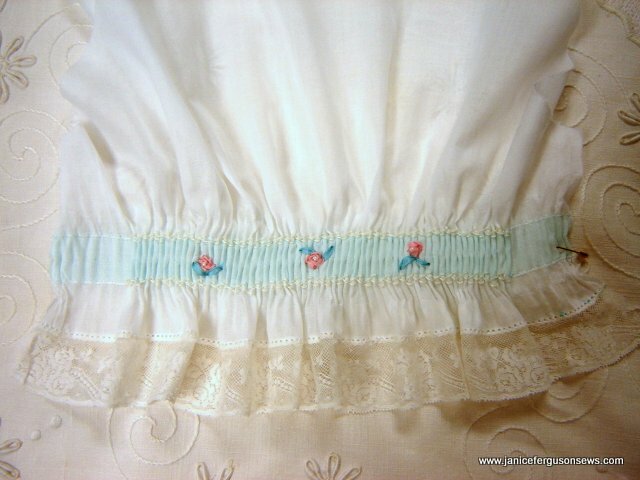 Then, with a wing or sharp needle and fine thread that matches the lace color, the stitch settings are rehearsed on a scrap. The goal is for the “reach” stitch, the horizontal one on the diagram, to reach over the lace header. 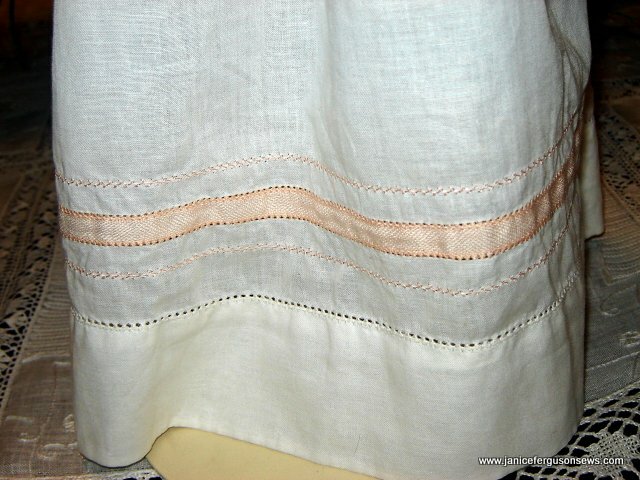 The forward/backward stitches should be close to the header. As it stitches, the needle penetrates two layers of fabric and then one layer of lace. As mentioned before, a good starting point is W. 2.5 and L. 2.5. If there are any puckers, reduce needle tension a little. If the appearance is still not satisfactory, place a length of Stitch & Ditch under the piece. Step #3~the pin stitch is worked over the fold. Notice that the straight stitch is covered by the reach of the pin stitch. Worked in thread to match the lace, this line of straight stitch disappears into the header. Step #4..folded excess fabric is trimmed away. Of course, this would be much prettier with ecru thread. Step #4…finally, the fabric that has been pressed up from under the lace, toward the foundation fabric, must be trimmed away. I have greatest success with the curved snips for machine embroidery. After that, I usually run my fingernail along the trimmed edge to bring up any stray threads, which I snip away. Step #1…straight stitch in each header. Of course, you would not use black thread. 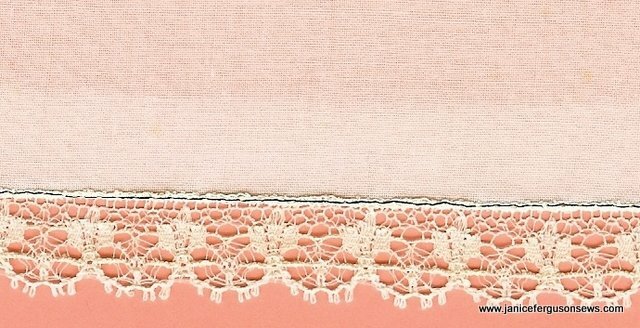 Use thread to match the lace. 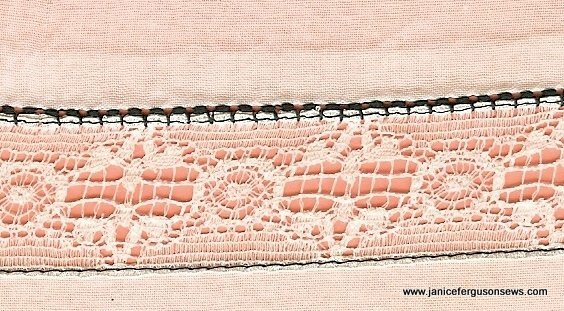 For lace insertion, step #1 is to place it flat against the fabric and straight stitch in each of the headers. 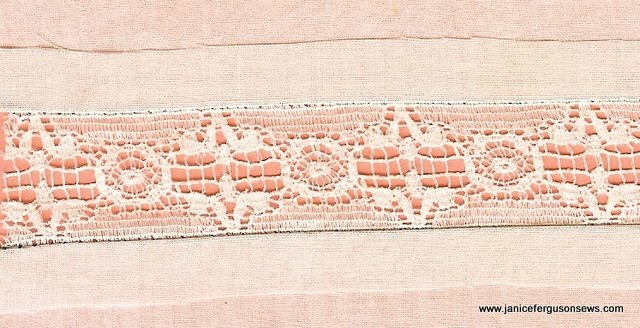 Step #2…expose lace by pressing fabric away from lace. Step #2… slit the fabric under the lace, down the center, parallel to the straight stitching. Then the fabric is pressed away from the center, exposing the lace. Step #3 ..work pin stitch through fold. Step #3…the pin stitch is worked over the fold, with the reach into the lace. Step #4…pin stitch is worked on second side, just as on the first (photo showing both sides pin stitched has been corrupted. I hope you can picture it anyway). NOTE: Remember to do a sample first. Then, if there are any puckers, reduce needle tension a little. If the appearance is still not satisfactory, place a length of Stitch & Ditch under the piece. 1. As already shown, most often, pin stitch is used to join lace to fabric, either an edging on collars, handkerchiefs or blankets, as shown on Alastair’s butterfly blanket. or insertion, as used on Laurel’s ’10 Easter dress. 2. 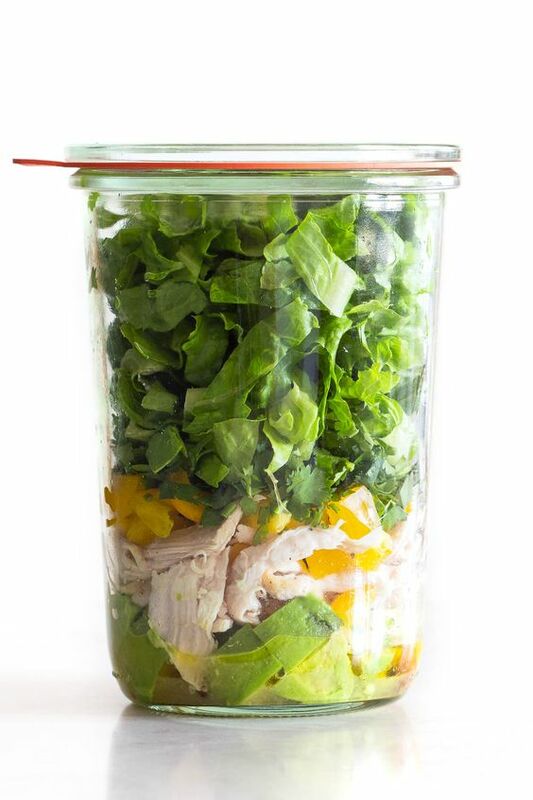 It can be used to hold tucks in place. This technique was used on my Laurel’s first birthday dress. 3. Securing Madeira applique’ pieces is another common use for the pin stitch. 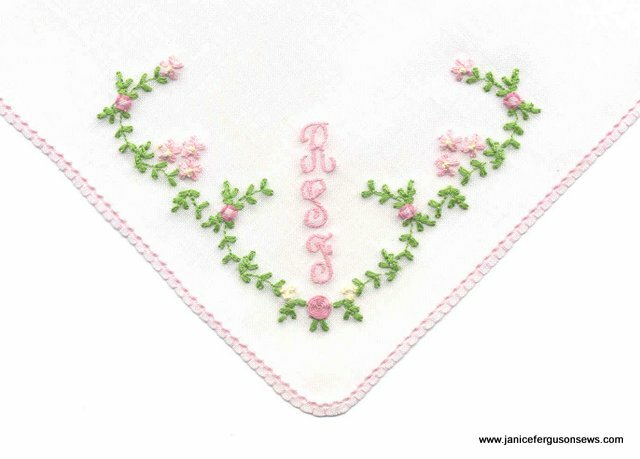 I frequently use it on pillowcases, such as this monogrammed pair, made for my daughter’s birthday. Or on the center panel of this lady’s blouse, where the Madeira panel as well as lace tape and lace insertion are all pin stitched in place. 4. Pin stitch is a good choice for making holes for small crochet hooks. On this pocket, a pin stitch was worked over the fold of the pocket top. Then the folded fabric was trimmed away. A crocheted edge was stitched through those neat, perfectly spaced holes. On another child’s tea set, made for my granddaughter, pin stitch is used for both the finished edge and the Madeira applique’ piece. Do you know of any other applications for the pin stitch? Please share with us if you do. Soon, there will be a similar post on entredeux. For ease in comparison, clear photos will show both machine made entredeux and pin stitch on the same garment. NOTE: entredeux tutorial is now posted here. I hope you will check back. Please send any suggestions for how this could have been clearer before I write the entredeux post. Also, please let me know if these two pin stitch posts are helpful. 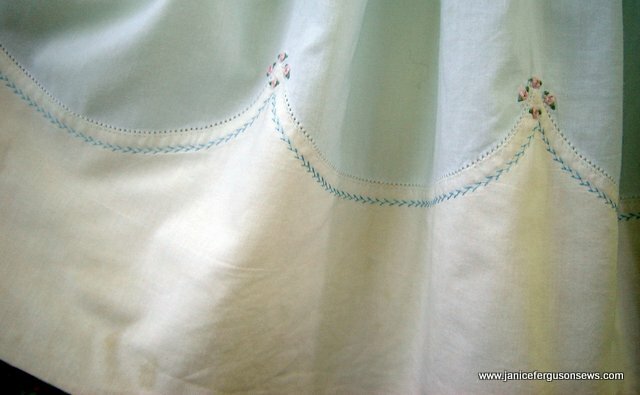 This entry was posted in techniques, Tutorials and tagged hemstitch, Madeira applique hem, pin stitch tutorial, pinstitch tutorial. Bookmark the permalink. Thank you, Janice. I have a question, though. I read the article in the newest Sew Beautiful about the christening gown that Phyllis DePiano made for her granddaughter. 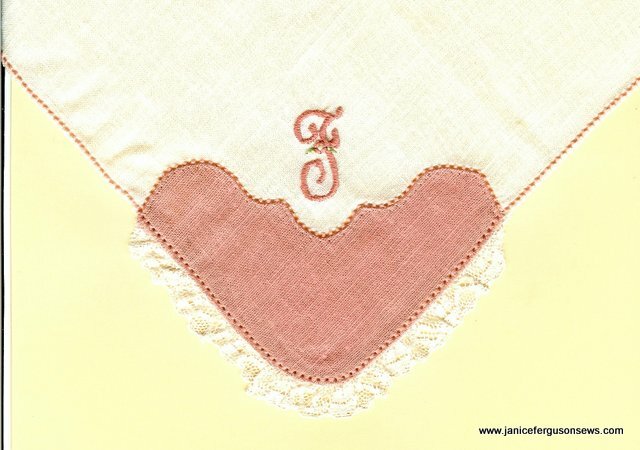 She used the Godet Christening Gown pattern from Grandmother’s Hope Chest. My particular interest in this piece was the way the gown sections were joined. Phyllis made 5/8″ seams and then pinstitched down the center (I’m thinking ‘in the ditch’) and then along the opened seam edges, making for a nice finish both on the inside and the outside. I can see how the edge finish works, but I can’t see how the center pin stitch is done because there is not a close up picture of this. It seems that if you put the pin stitch down the center, the reach will be to one side or the other. Wouldn’t that be awkward? I don’t yet have that SB issue and would have the same question as you. 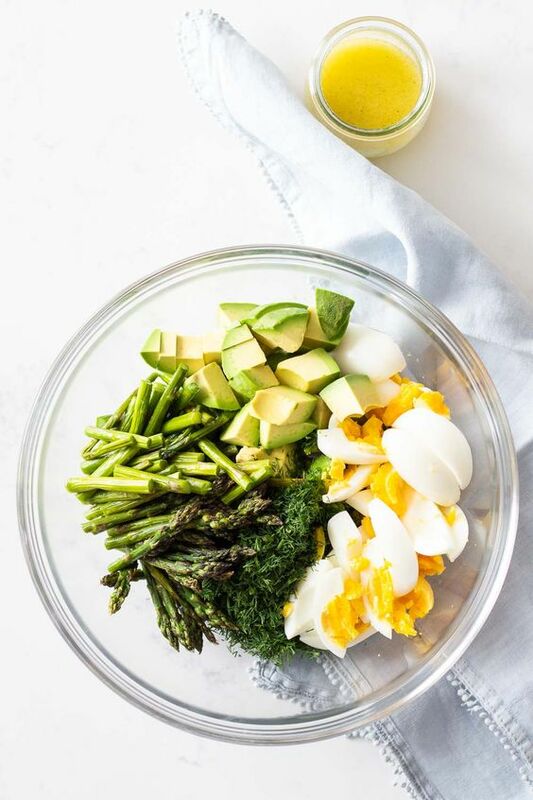 I have used entredeux stitch like that and hope to dig out the photos or samples which show this technique. With entredeux stitch, the “reach would essentially be on both sides with the hole positioned in the pressed open seam line. It likely the entredeux post with that example won’t be posted for several days–life, you know–but I will be sure to address that technique, which is really fabulous. Thank you so much for these posts. I’ve loved trying this technique. One day I dream of attending classes and retreats and conferences but right now in my busy little young family, this is the best! I used pinstitching on a halloween costume this week. I need some practice but so pleased with the result. Thank you so much for these informative posts. I live in a small coastal town on the southern part of South Africa a 100km from the nearest big town . I’ve been making handkerchiefs to sell at Chritsmas time to holidaymakers that come in thousands to our town which is called Stillbay. Anyway I ran out of ideas for hemming these articles , now I’m all set to getting going again. Marthie, I’m so glad this tutorial was helpful for you. The pinstitch finish without lace on your handkerchiefs will be lovely. I hope you sell them all! Lovely work and very informative tutorial. 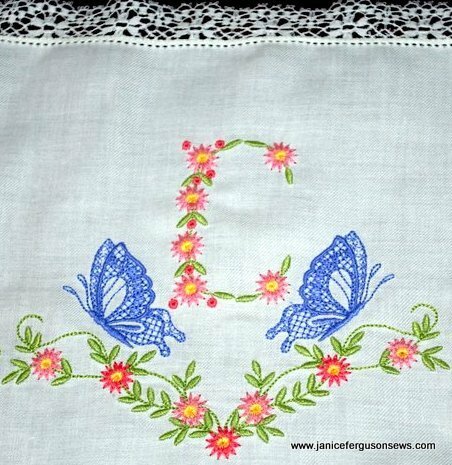 I hope to try this very soon on some already purchased napkins that I plan to give away as a give to someone special. Heidi, I’m so glad you found the pinstitch tutorial helpful. Adding this to your napkins will be a lovely touch. Annalise, thanks for this suggestion. I’m putting this topic on my upcoming tutorial list. I do love Madeira hems!